One of the most requested features for Pearl Comments is to the capability to control how comments are displayed in the sidebar and on the page. As we already mentioned, in the 1.5 release of Pearl Comments for Firefox (and other Mozilla-based browsers) you can control the appearance of the comments using CSS. Most of the elements we use to render comments have CSS classes assigned to them. All Mozilla-based browsers allow users to customize the display of web pages via a configuration file named userContent.css. To customize Pearl Comments, you add CSS rules to that same file. The first step is to find your profile folder. Inside the profile folder, you will find a folder named chrome. Inside the chrome folder you will need to create a text file named userContent.css (if that file already exists you can simply add more CSS rules to it). There is detailed information available on mozilla.org’s site. Remember to restart your web browser after changing the userContent.css file. Additional notes: the comment text is contained within an iframe, and the body of that iframe has the class PearlCommentNoteBody. Also, if a comment has a status such as “In Progress” one of the status classes mentioned earlier is added to the PearlCommentNote elements as an additional class. We plan to provide more extensive documentation soon, but this should get you started. If you want to tweak something and cannot figure out how, do not hesitate to ask us. 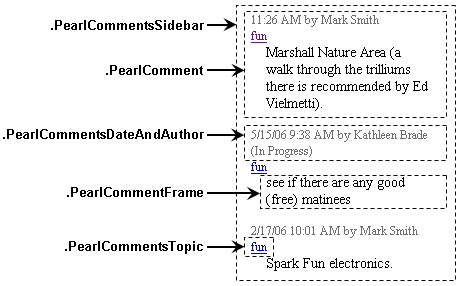 This entry was posted on Friday, May 19th, 2006 at 4:16 pm by Kathleen Brade	and is filed under CSS, Pearl Comments. You can follow any responses to this entry through the RSS 2.0 feed. Both comments and pings are currently closed.